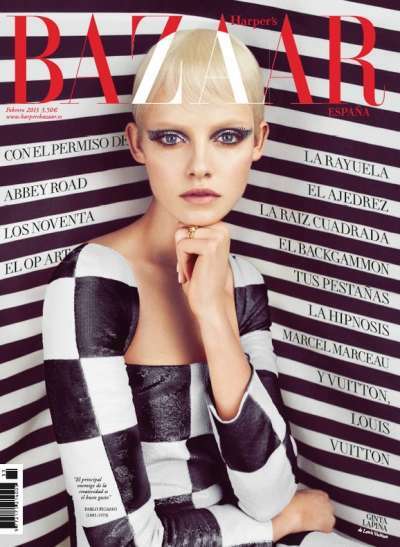 Ginta Lapina covers the Harper's Bazaar Spain February 2013 issue. The top model is lensed by iconic photographer Txema Yeste who captures her in a 60s inspired photo series. Dressed in a cube-printed black and white dress, the model is retro chic as she pulls off an outfit that matches her striped monochromatic backdrop. The platinum blonde beauty sports the latest from Louis Vuitton, and shows off her Twiggy-inspired coif and sultry eye makeup look. 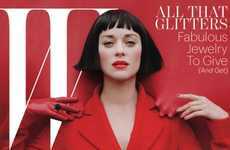 With big blue eyes and a boy short hairdo, Ginta is classically chic and sophisticated in the Harper's Bazaar Spain February 2013 cover shoot. A revival of the 60s MOD movement, this fresh portrait series re-introduces a retro womenswear aesthetic to a new generation of fashion followers.